This photo was taken about 16 years ago. From left to right we see Michael, Kayla, Sarah, Laura, and Debra. We used to raise a few chickens (for the eggs, and to give the children the opportunity to become competent in caring for them). However, chicks are cute, and as they get their feathers in they are still cute, and so the children made pets of them. 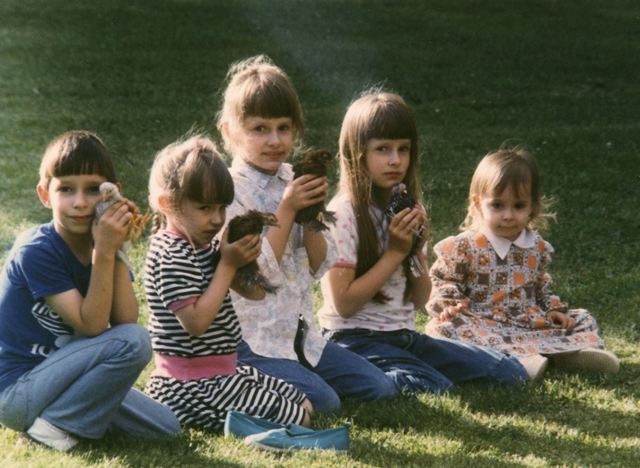 In this photo, each child is holding a favored chick. Even when the chickens became large and comparatively ugly, some of the children continued to tame them and make pets of them. I remember that Sarah had one pet, a crippled chicken, to which she daily brought food and water.